Engaging the Enemy is a better book than Marque and Reprisal, but overall this series seems to be maintaining a qualitative equilibrium. I keep wishing it'll get great, while Moon insists on delivering work that's only pretty good. I think the Elvis song sums it up the best. "A little less conversation, a little more action..." This series is the talkiest, most exposition-packed space opera I've read in recent memory. It's like SF for accountants. It's a story for people who'd be more interested in seeing Han Solo's itemized bills of lading and monthly fuel and ordnance expenses than to see him actually blowing up TIE fighters. That's not to say it's bad. In effect, what Elizabeth Moon has done with the Vatta's War series is develop a narrative that actually explores, in a manner most space opera doesn't, exactly how the economics of interstellar trade would function. What kind of banking would you have? Would laws that apply in one system apply in all others? How would patents be handled? Would monopolies and piracy be real threats? All of these questions are addressed with much intelligence and storytelling craft here. But it does mean a lotta conversation, notta lotta action. In Engaging The Enemy, interstellar piracy is the bogeyman international terrorism is to us. Maverick captain Kylara Vatta, trying desperately to piece together what little remains of her family business in the wake of the attack that virtually wiped them out, finds evidence that the whole thing was masterminded by a particularly nasty pirate captain, in collusion with a rogue Vatta (dealt with in Marque), and perhaps the very government of her home world. This prompts her to start spreading the idea about to other trader captains that a multisystem military force to battle the pirates is needed, and that she's well prepared to start one herself. This kind of inflammatory talk gets her noticed, by both potential allies and foes. Ky remains an appealing heroine, while supporting characters from previous installments — particularly her cousin Stella — undergo some profound changes and come into their own. Rafe is a less irritating figure than he was in Marque, and there are some amusing subplots, one in particular involving the orphaned boy Toby and what he learns about the small dog he rescued. There are some good surprises at the climax, hinging upon the identity and history of one major character. Still, for all that did impress me here, the book had more than its fair share of nail-tapping longueurs. For one thing, the title gives you the impression that you'll get to see Ky, you know, engaging the enemy. That doesn't really happen, except in a climactic battle scene in which Ky witnesses the first attempt at joining forces to oppose the pirates not really go as planned. 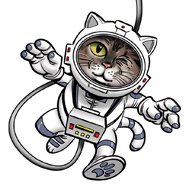 (And let's just say that when it comes to writing a space battle, Moon is not exactly delivering at Weber or Bujold levels.) While Moon's fascination with the financial, legal, and technical minutiae of her future certainly enhances the believability and realism of that future, it doesn't always lend itself to the kind of suspenseful, white-knuckle storytelling we want this type of SF to be. 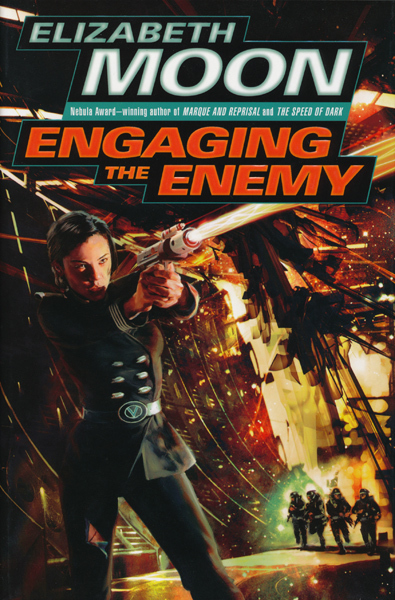 Engaging the Enemy is an intellectually — if not viscerally — satisfying space opera. A little less conversation, a little more action, and Moon would have done a much better job of engaging the reader.